Double click an empty area in the calendar view, while a task calendar is active in the Calendar List, to create a new task. Double-click an existing task to open it. Right-click the calendar view and select the "New Task" command from the popup menu, or the "Open Task" command if a task is clicked. Create a new task using the "New -> Task" command on the File menu, or press Ctrl+Shift+T. Create a new task for a contact via the right-click menu in the Contact List or the toolbar in the Contact Editor. Create a new task link via the Links tab in the various editor windows. Click the title of a task in the Details pane. Double-click a task in the Tasks area of the Desktop Calendar. Click the task title in a desktop alert. 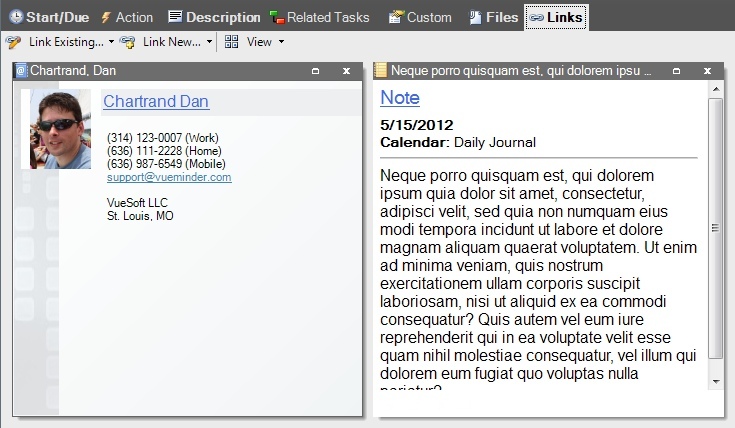 Open a linked task from the Links tab in the Event Editor, Note Editor, or Contact Editor. The Task Editor window enables new tasks to be defined or existing tasks modified. When you create a new task, the following window will be displayed. The initial/default values will be different, based on your options, the Task Calendar Properties, and the active task calendar name. This window will also be displayed when opening an existing task, enabling you to view or modify any of the task's parameters. Tabs are displayed enabing modification to the task reminder, details, file attachments, and links to other items. If any data or settings have been entered on a tab, the tab's name will be bold to indicate data is present. 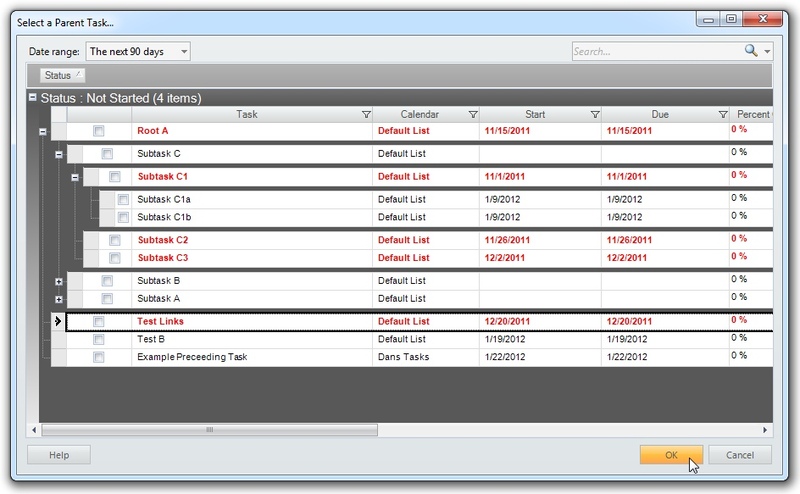 Tasks are displayed in the Task List and Desktop Calendar. They can also be displayed in the Calendar View when the View menu option to show tasks is enabled. A toolbar appears at the top of the Task Editor, providing a number of commands. Save And Close - Saves the task and closes the editor window. The keyboard shortcut is Ctrl+S. Save - Saves the task but leaves the editor window open. Save and New Task - Saves the task and creates a new task in the same editor window. The keyboard shortcut is Ctrl+N. Delete - Deletes the task and closes the editor window. The keyboard shortcut is Ctrl+D. Print - Prints the task details. The keyboard shortcut is Ctrl+P. Email - Initiates a new email using your default email program. The body of the email is initialized from the current task. The keyboard shortcut is Ctrl+E. Defaults - Expands in to a submenu for saving the current task data as the default for new tasks belonging to the same calendar, or loading the associated task calendar's defaults, which will override the current settings. Previous/Next Task - Saves the current task and opens the previous or next task in the same editor window. The next or previous task is found by using the date and time of the current task and searching backward or forward in time until another task is found. The keyboards shortcut are Alt+UpArrow and Alt+DownArrow. The "Task Defaults" button enables the currently specified reminder settings, as well as the details and other basic information, to be saved as the default for any new task that are created belonging to the same calendar. This is equivalent to modifying the task defaults in the Task Calendar Properties, but is a convenient shortcut. You can also load the default settings and assign them to the current task. This is a short title or description of the task. There is no limit to the length. If tasks are displayed in the Calendar View, they will be titled with the text entered here. This title will be displayed in the Task List and Calendar View to identify the task. The task will belong to the specified calendar. Clicking the drop-down arrow will display a list of all task calendars. You can type a different calendar name to add the task to a new calendar. 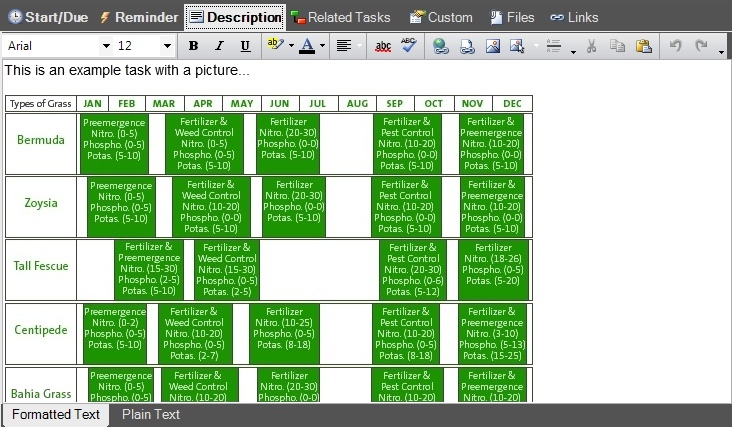 The calendar will be created after closing the Task Editor window. When opening an existing task, you can use the Calendar field to reassign the task to a different calendar. When reassigning an task to a different calendar, a window will be displayed asking if the default properties of the destination calendar, such as the category and reminder settings, should be applied to the task. Tasks can be assigned to one or more categories. 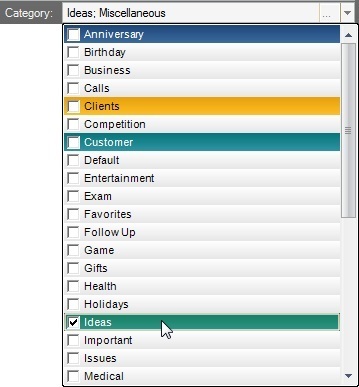 The Task List can display task categories in a column, and this column can be sorted or filtered. To assign categories, place checkmarks in the desired categories, accessed from the Category drop-down list. Tasks can be assigned a priority. The task status can be set to Not started, In progress, Completed, Waiting, or Deferred. The status can also be set by right-clicking the task in the Calendar View and selecting the desired status from the popup menu. When the status is set to "Completed", the percent complete will be updated to 100%. If the task repeats, this will result in the next instance of the task being added to the calendar. If any other tasks have start dates that are dependent upon the completion of the edited task, those tasks will be updated to start on the current date. The "Start/Due" tab has allows entry of when a task should start and when it should be due. A task can have no specified start date, a date only, or a date and time. Tasks can also start when a subtask is completed or when another task is completed. No start date - The task has no defined starting date. It can have a due date, but the start date is either unknown or arbitrary. On date - The task will start on a specified date, selected using the date drop-down to the right of the Start field. If there's a reminder, it will appear based on an offset from the specified date. On date/time - The task will start at the specified date and time, using the date and time drop-downs to the right of the Start field. If there's a reminder, it will appear based on an offset from the specified date and time. When first subtask starts - The task will start when the first of its subtasks is scheduled to start. If the first subtask is reschduled, the task will move along with the subtask. When another task is completed - The task will start when another task is marked as completed. This option is useful if you have a sequence of tasks that need to be completed in order, but you're not sure when exactly each task will be finished so the next task can begin. When this option is selected, a task browser will appear where the preceeding task can be selected. The browser window supports the same search and filtering capabilities provided in the Task List of the main window. After a preceeding task is selected, its title will appear to the right of the Start field. Clicking the preceeding task's title will allow selection of a different preceeding task. The preceeding task can also be opened or removed. A tsk can be due on a date, at a date and time, or when its last subtask is due. Tasks can also be defined without a due date. No due date - The task has no due date. If this option is selected, the task will not have a start date either. This option is useful if you are aware of a task, but aren't sure yet when it needs to be completed, or if the task can be completed whenever time allows. On date - The task will be due on a specified date, selected using the date drop-down to the right of the Due field. If there's a secondary reminder, it will appear based on an offset from the specified due date. On date/time - The task will be due at the specified date and time, using the date and time drop-downs to the right of the Due field. If there's a secondary reminder, it will appear based on an offset from the specified date and time. When last subtask is due - The task will be due when the last of its subtasks is due. If the last subtask is rescheduled, the task due date will move along with the subtask. Tasks can be marked as repeating by checking the "Repeats" box and entering an interval. You can use repeating tasks to keep track of things that need to be done periodically, such as changing the furnace filter or replacing smoke detector batteries. The task can be set up to repeat any number of days, weeks, months, or years. This value will be used to calculate the next due date when an instance of a repeating task is marked as completed. When a task is configured to repeat, you can specify whether the next due date should be calculated based on the previous completion date or the previous due date. A list of available actions is shown on the Reminder tab of the Task Editor window. Actions can be enable or disabled using the associated checkbox. Actions that have already been performed will be indicated with gray checkmarks. The task description/details can be entered on the Description tab using a full-featured WYSIWYG editor. 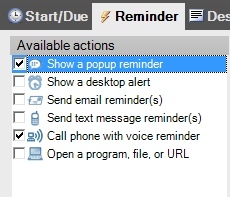 If a popup reminder is configured to show the task's description, this text will appear in the reminder window. If an email reminder is sent, the description will be included in the email. The description will also appear in the Details Pane when the task is selected, as well as the task's tooltip balloon when hovering the mouse over the task in the Calendar View. If the description contains links to web pages or files, those links will be clickable in the Details Pane. You can also hold the Ctrl key while clicking a link in the text editor to open the link. 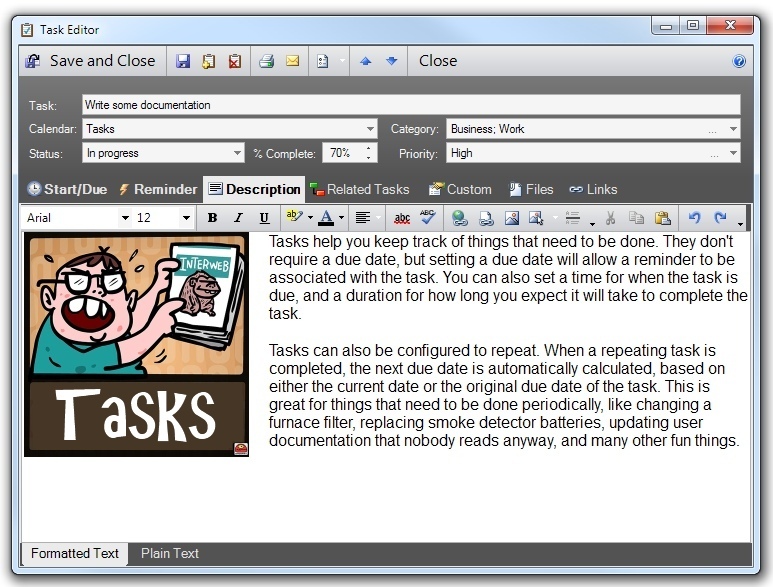 The Related Tasks tab enables a parent task to be specified for the currently edited task. New or existing tasks can also be defined as subtasks. To select a parent task, click the "Parent Task" text field. A browser window will appear enabling selection of the desired parent task. The list of tasks in the browser can be searched, sorted, and filtered, much like the Task List in the main window. 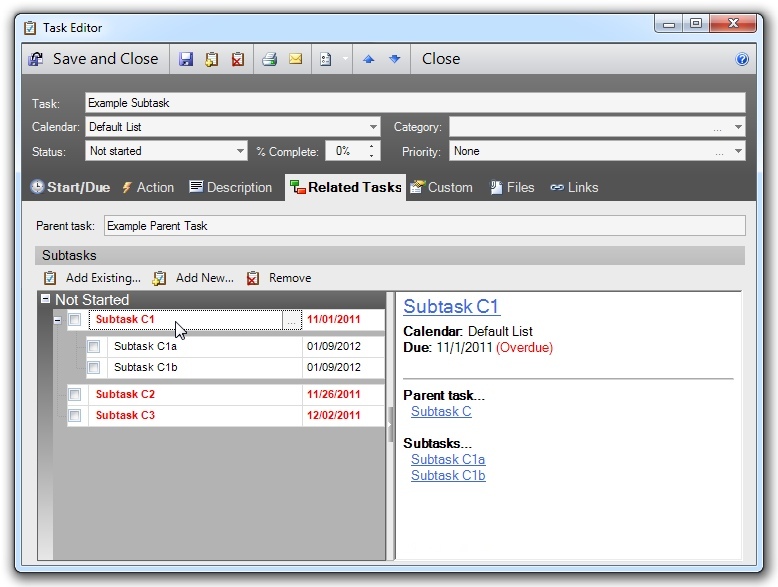 After a parent task has been selected, its title will appear in the Parent Task field. Clicking the parent task field will enable a different parent task to be selected, the current parent task to be opened, or the parent task association to be removed. New or existing tasks can also be defined as subtasks. To add an existing task, click the "Add Existing" button. A browser window will appear, similar to the browser shown when picking a parent task. Click the "Add New" button to create a new task and assign it as a subtask. Below is an example of a task that has both parent and subtask relationships. When a subtask is clicked in the list, its details are shown to the right. Subtasks can be marked completed in the Related Tasks tab by checking their boxes. Subtask due dates and titles can also be modified. Any number of file can be attached to the task (as links), using the Files tab. If a popup reminder is configured to show the task details, linked filenames will appear in the reminder window. The files will also appear in the Details Pane when the task is selected. Files can be opened from the Files tab by double-clicking or using the Open command on the toolbar and right-click context menu. More information can be found here. Tasks can be linked with other tasks, events, notes, or contacts by using the Links tab. When a link is created, it becomes 2-directional, meaning a backlink to the task will be automatically added to the linked item. Linked item details will be shown on the Links tab. For example, when a task is linked to a contact, the Links tab will show the associated contact's email address and phone number. More information can be found here.